This car started life as a white 1965 Corsa 140 coupe. It was a car from Mississippi with about 85,000 miles, a good body and a sick engine. The donor car was a new 1990 Cadillac DeVille with less than 350 miles on the odometer that was involved in a fire. The builder was Larry Cooper, a GM engineer who completed the engine transfer over the next several years. He used this car for many years to attend car club events, local rod runs and to cruise around town. Larry mounted the entire drive train with its 4T60 4-speed automatic on a full sub frame. Strut towers were built over the rear wheels and the entire Caddy drive train was bolted into the back of the Corsa. Many components from the Cadillac were used including the radiator which was mounted in the rear using the two stock puller fans supplied with the original Cadillac cooling system. 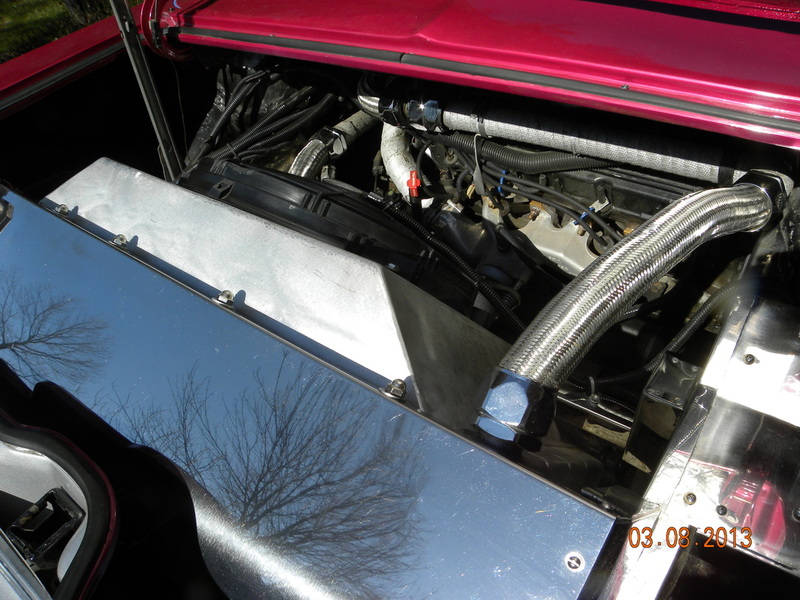 The engine oil cooler and transmission cooler were installed in front of the radiator. This setup provides a 40% front to 60% back weight ratio; not perfect, but still offers better handling than a stock Corvair. The engine is still computer controlled and can be monitored via the ALDL connector located conveniently outside of the engine cover. At the 2007 Detroit CORSA convention this car caught my eye, but it was an automatic and the engine was transversely mounted in the back. It drove fine, but I was undecided. Several weeks after the convention and after listening to several friends, who were more impressed with the car at the time than I was, I negotiated a deal and went back to Detroit with my good friend Dave Abell to retrieve my new prize. For the next year I spent my time upgrading the braking system. The car would go, but it didn’t stop very well. 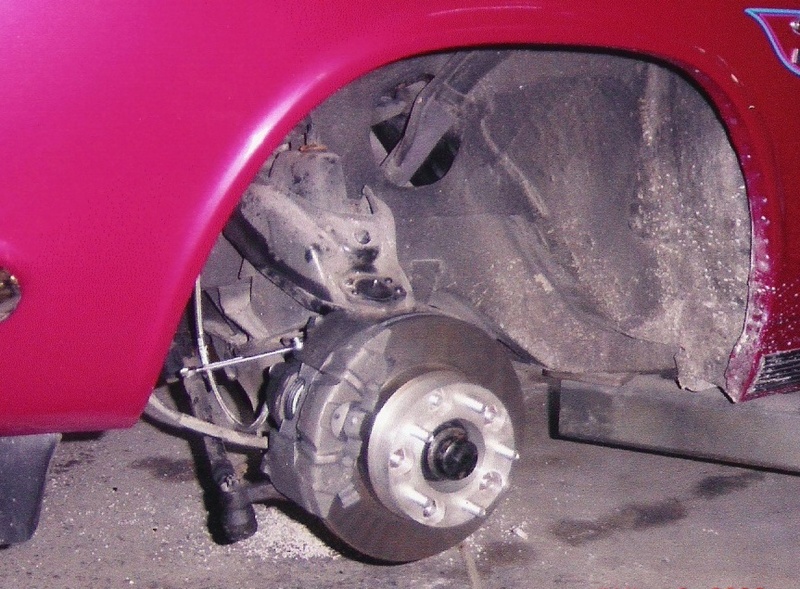 The brake problem was corrected by upgrading the front drum brakes to match the rear disc brakes and a Camaro style power booster. Recently the entire cooling system was removed and replaced by Jack Brown Engineering, a local race car builder, to improve high speed cooling. Future suspension and steering improvements should complete the process. The 2008 Corvair Olympics in Indianapolis was my first experience in any competitive racing events. The Putnam Park track was amazing. Since the car was not yet prepared for road racing, I elected to participate in the "Taste of the Track" event. Now I know where my heart is. If Paul Newmann (God rest his soul) can race at 83; so can I at 65. The Muncie Dragway event was also my first time on a drag strip. Thanks to Brian O’Neil, I was allowed to make a "solo" run down the track. The Corsa 4.5L turned the quarter mile in 15.1 seconds at 89 mph. Unfortunately my reaction time was 1.0 seconds; so I could have done better. The autocross event, again my first, was scary. After the first run, I was hooked. After the fourth run I had shaved almost 17 seconds off my first run. The Corsa 4.5L was starting to feel controllable. With its relatively modern drive train, the Corsa 4.5L can be driven without breakdown concerns to events far away. When I drove it home from Detroit, the car registered an amazing 34 miles per gallon. That easily beats any of my other vehicles. The Corsa 4.5L offers dependable transportation and fun performance. Like I told Larry, "don’t ask to buy it back". A manual dual master cylinder was installed as a brake system update when the engine work and restoration was done in 1995. Braking was slow and the pedal pressure required for quick stops was excessive. For autocrossing an additional update was necessary. The old master cylinder was replaced with a BM1746 GM 7” dual diaphragm booster with a dual master cylinder. The cylinder has a 1-1/8” bore and can be used with either two or four wheel disc brakes. 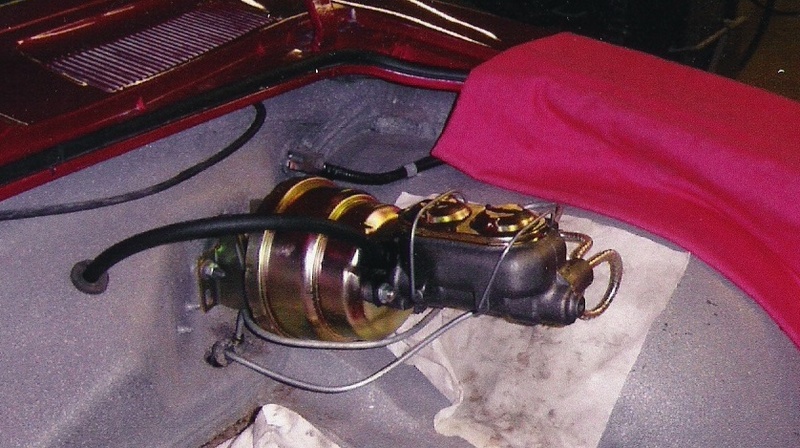 The booster was supplied by Master Power Brake, Mooresville, NC (888-533-1199) and was designed for 1964-72 GM mid size cars and the 1967-69 Camaro/Firebird. Jack Brown Engineering, Louisville, KY performed the change over. The 7” booster was installed without modifications to the firewall or inner fender. The clevis pin was connected to the existing hole in the pedal without modification. A custom bracket was fabricated to shim the booster to the firewall. The shim was used mainly to provide clearance for the master cylinder with the underside of the hood. Vacuum to the booster is provided via a 3/8” diameter rubber fuel hose to avoid later problems with hose collapse. The engine has no problem providing 18 inches of vacuum without a reservoir. 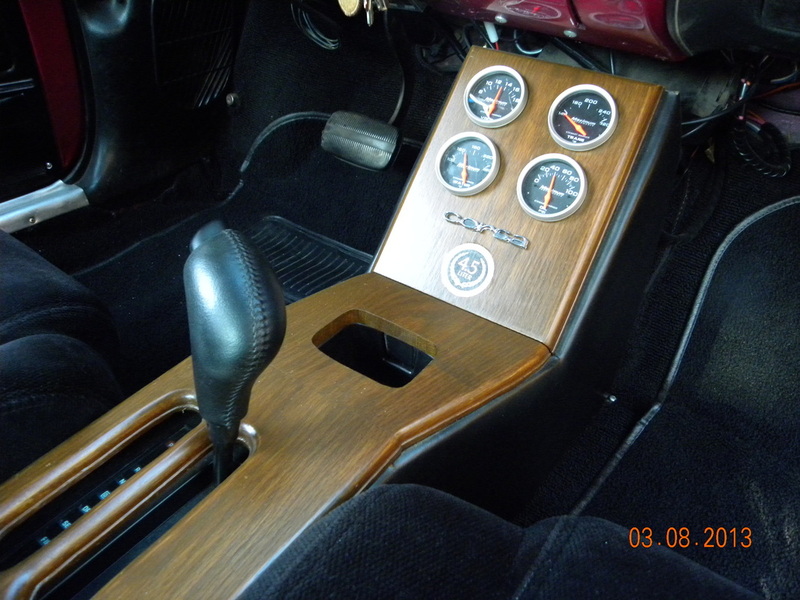 An adjustable proportioning valve is located on the master cylinder and a balance block was installed on the inside firewall above the throttle pedal (part number and manufacturer unknown). The booster modification provides an impressive improvement in braking with reduced pedal pressure. After the first stop, the pads are warm enough for quick stops and fade is barely evident. The stock front drum brakes on the 1965 Corsa 4.5L were replaced in May 2008 with a pair of disc brakes supplied by David Clemens at Stinger Motorsports in Roanoke, VA. The rotors (10.5 inch) are aftermarket units manufactured in China for a 1985-92 Chevy S-10 truck with 4WD -Part #71401 and 73281. The calipers are remanufactured units for a 1988 Oldsmobile Delta 88 -OEM, Friction Choice Caliper, #18-4194 and 18-4195 . The brake pads were manufactured by Performance Friction Brakes (www.performancefriction.com), 1-800-521-8874. They are carbon metallic pads (#0215.20) recommended for autocrossing. Two pressure check valves were installed in the brake system to provide a higher brake pedal. The wheel studs (serrated bolts) were replaced with Dorman #610-259 bolts (7/16”-20 X 1-3/4”) on the modified stock Corvair wheel hub. Attached to the front wheel hubs is a pair of custom made aluminum adapter plates (1-1/4” thickness) with metric bolt pattern to match the front and rear wheels for convenient wheel rotation. The adaptors were made by Champion Machine & Wheel, Louisville, KY and the installation was performed by Jack Brown Engineering, a speed shop and fabricator, located in Louisville, KY. It was a great convention but it was hot and humid. On Friday, Autocross Day, it was 95 with a heat index at 100. I had a rain forest in my helmet. I was happy with my three runs. Started the course with a 58 sec run and finished my third run at 50 sec. For me to drop of 8 seconds - that's known as a miracle in some circles.